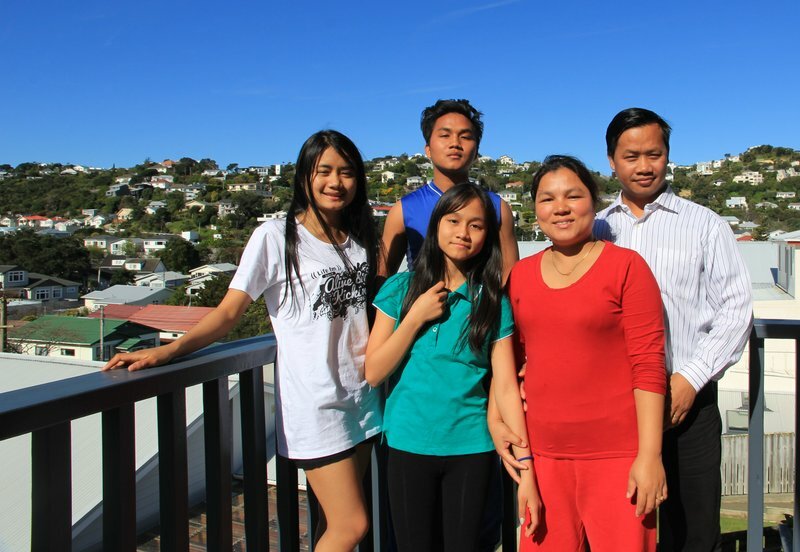 The Parte family has already been making a positive impact on their community, despite only arriving in New Zealand at the start of July. Frank and Mary Parte, along with their four children, fled Myanmar where they were struggling to survive as a complicated and multi-layered conflict raged around them. The family were excited when they were told they’d be resettled in New Zealand, having heard it was a nice and peaceful place where everyone cared for each other. Frank and Mary say that arriving in Wellington to find a house already set-up and furnished with donated goods went above and beyond their expectations. The family had been worried that arriving in Wellington and beginning their lives again would be a daunting process. They were relieved to find that their fears had been unfounded and have settled into life here. Their four children are attending a local secondary school and the house is filled with the sound of exuberant and energetic teenagers. Their son, Peter, tinkers on a keyboard. It’s a skill Frank’s been teaching his eldest child in preparation for a community concert where he’ll make his public debut. Their third daughter is visiting an aunt nearby; familial connections in the community have played a big part in helping the family feel settled. The Parte’s are looking toward the future with confidence. Mary is learning English and hopes to find some meaningful employment when she’s advanced through the course. Frank, who speaks excellent English, has already secured some part-time work and has a lot to offer New Zealand. He was a pastor in Myanmar, a job that saw him wear many different hats; counsellor, lawyer, psychologist, and mediator. Frank is hoping to do further study in the field of theology, an area he already has a Master’s degree in. The kids are focussing on their education with Frank and Mary holding high hopes for their children’s future. The family feels like their future here looks bright.